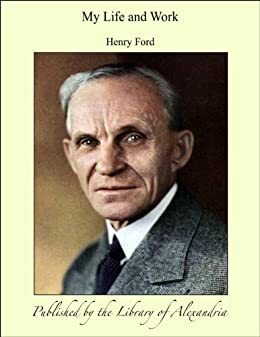 Henry Ford (1863–1947) was an industrialist who changed the face of automobile manufacture in America, becoming the epitome of American Capitalism. He lent his name to ‘Fordism’ – efficient mass production. 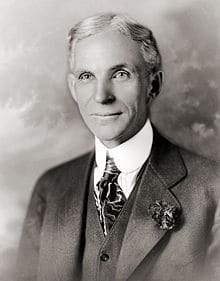 Henry Ford was born in 1863 on a farm in rural Michigan, near Detroit. From an early age, he expressed an interest in mechanical devices. He was given a pocket watch at the age of 15, and he developed a reputation for being an experienced watchmaker. Shortly after his mother passed away, Henry left the family farm to seek employment in Detroit. He worked his way up to becoming an engineer at the Edison Illuminating Company. By 1893 he had become chief engineer and gained the recognition and encouragement of Thomas Edison. Henry Ford retained a deep affection for Thomas Edison throughout his life. It was working as chief engineer at Edison’s that he was able to work on a petrol drive quadricycle. His testing was successful, and this enabled him to develop the quadricycle into a small car; this proved the basis for the famous Model T motor car introduced in 1908. The Ford Motor Company was formed in 1903 with the backing of $28,000 from various investors. Henry Ford astonished the industrial world by offering a daily wage of $5 a day. Even by today’s prices that was a very good salary. This wage was far above what anywhere else offered. At a stroke, it solved the problem of labour turnover and encouraged the best workers to come and work for Ford. Through paying high wages, Ford was able to encourage the highest level of labour productivity. Although many criticised his seemingly over-generous pay, he also pointed out, that the high wage helped the workers to be able to afford the cars they were making. However, Henry Ford was hostile to the role of trades unions. For a long time, he battled against the trades unions, refusing to have anything to do them. However, by 1941, with the workers on strike, his wife encouraged him to capitulate to the United Auto Workers (UAW). It was Henry Ford who also revolutionised the production line processes. He helped to develop the assembly line method of production and was always seeking to cut costs. Although he did not ‘invent’ the assembly line, he did make one of the most successful commercial applications of its potential. This led to his decision to give customers any colour they choose so long as it was black. The motive for insisting on black was because black was the quickest colour to dry and therefore the cheapest. The impact of the assembly line was to help reduce the cost of the Model T motor car. It helped Ford become the dominant firm in the motor car industry. An estimation from 1932 suggested Ford was producing 33% of the world’s automobile production. Henry Ford had a dislike of war. He helped to fund a peace ship to Europe in 1915 and spoke out against the ‘vague financiers who encourage war’. He never really got involved in the Second World War effort, though he allowed other officials in the Ford company to transform Ford into one of the biggest military plane builders in the war. Henry Ford also subscribed to various anti-semitic pamphlets. Although he later apologised for some of his anti-semitic views, Adolf Hitler admired Henry Ford. Ford is the only foreigner mentioned in Mein Kampf. Hitler wanted Volkswagen to mirror the production techniques and philosophy of Ford Motor company. Henry Ford was also noted for some of his inspirational self-improvement quotes – emphasising hard work and self-sufficiency. Towards the end of his life, he spent considerable time with his friend Thomas Edison, who moved into West Orange, New Jersey. Henry Ford, Thomas Edison and many others proved that the contributors of the world have mostly been people of little formal education. Which has been a great inspiration to many others. Most of the others who flaunt various degrees are nearly thr technicians of progress.